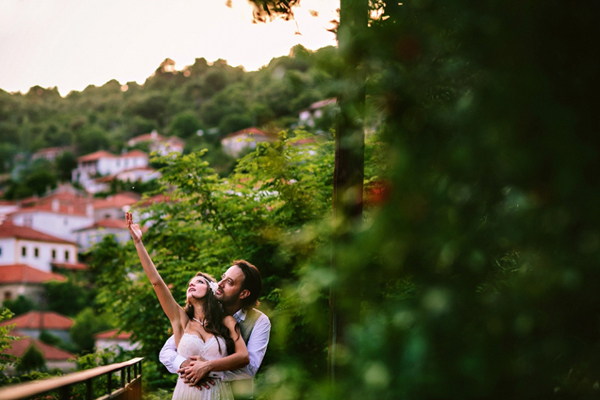 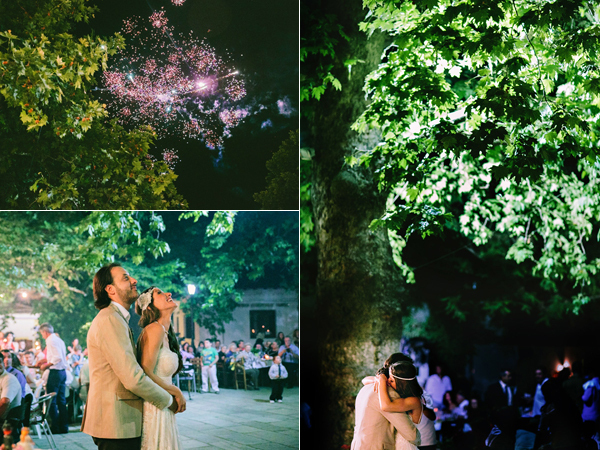 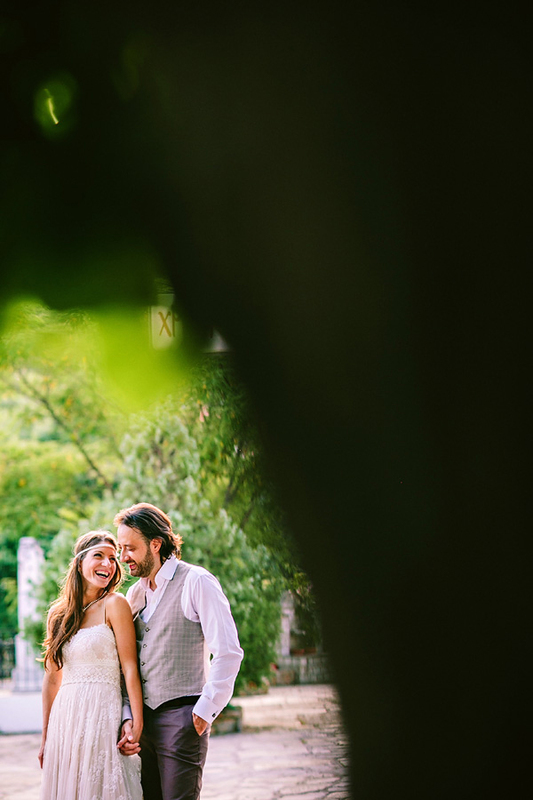 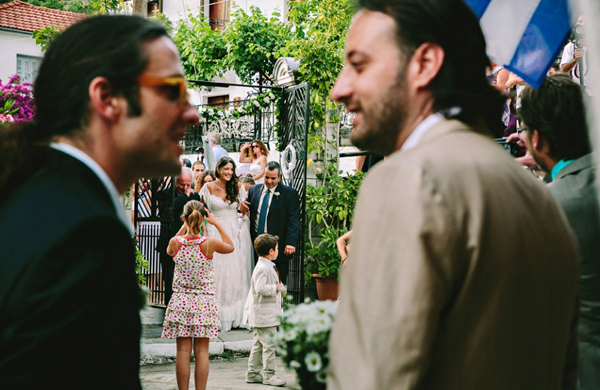 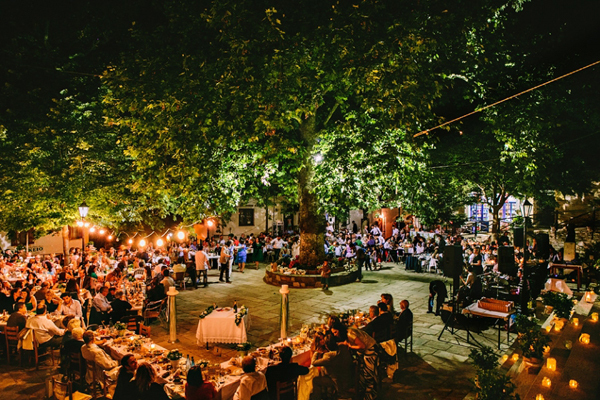 Areti and Andreas had a traditional romantic wedding in Greece in the southern part of mount Pelion, in a village called Promiri. 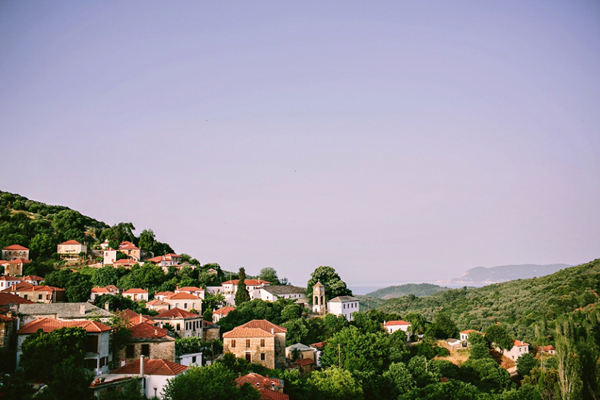 It is truly a breathtaking place with natural beauty, traditional mansions and stone walled houses. 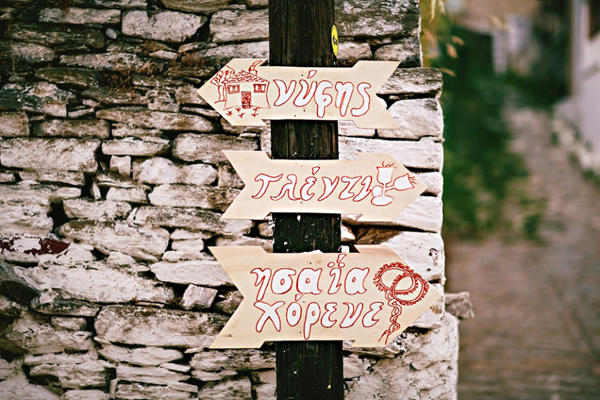 The magical journey for Pelion started with the original wedding invitation. 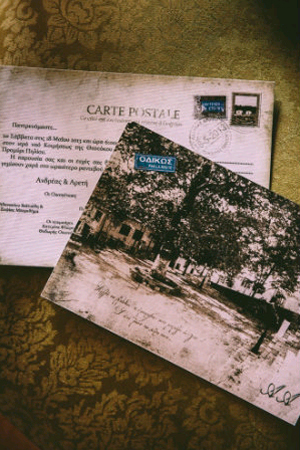 The wedding invitation that was designed by the crafty bride was a vintage post card replica that featured the town square in Promiri. 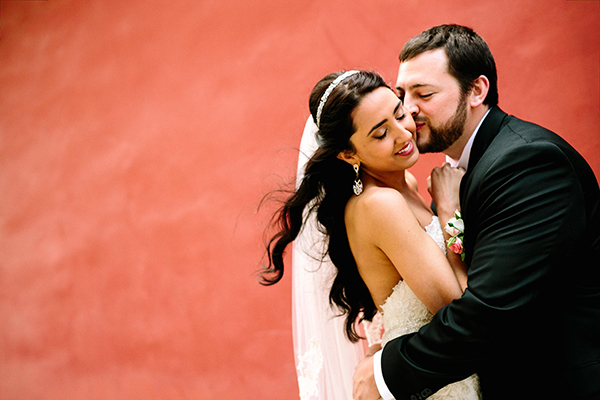 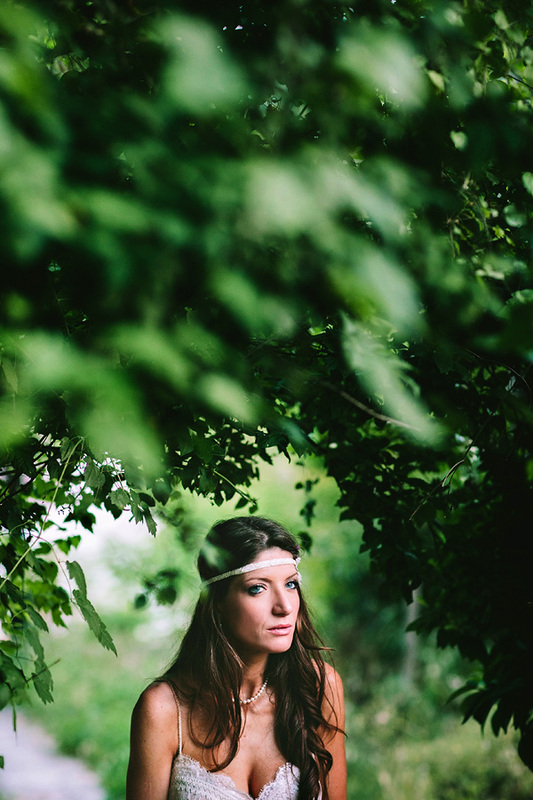 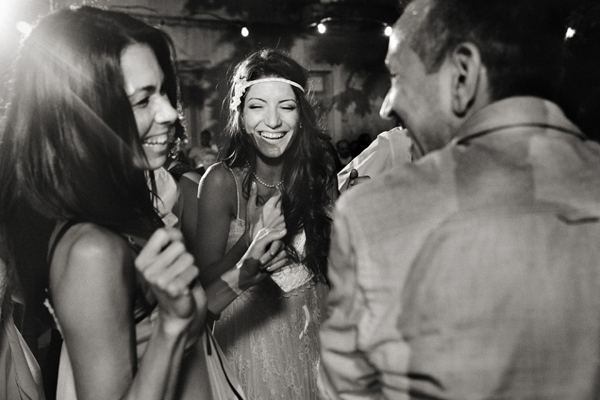 The bride was undeniable gorgeous, with natural makeup and luscious wavy hair cascading on her shoulders. 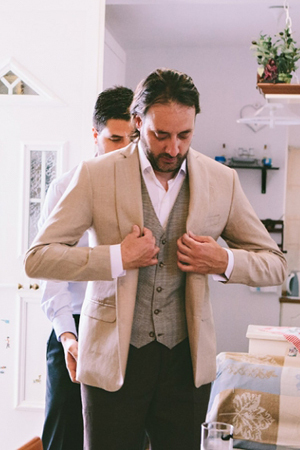 The groom’s wedding suit from the talented designer Ourania Kay was outstanding. 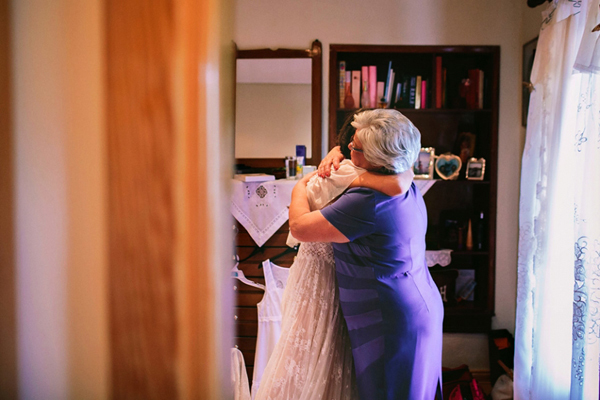 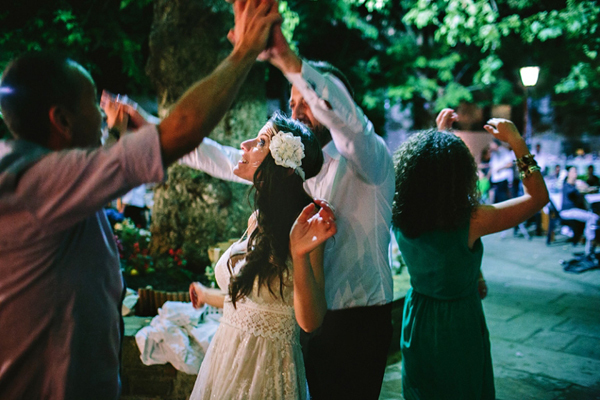 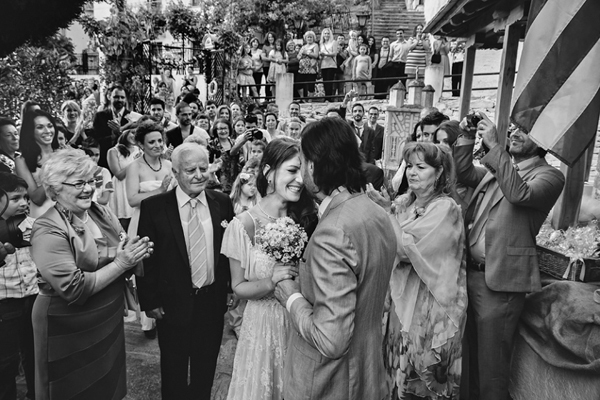 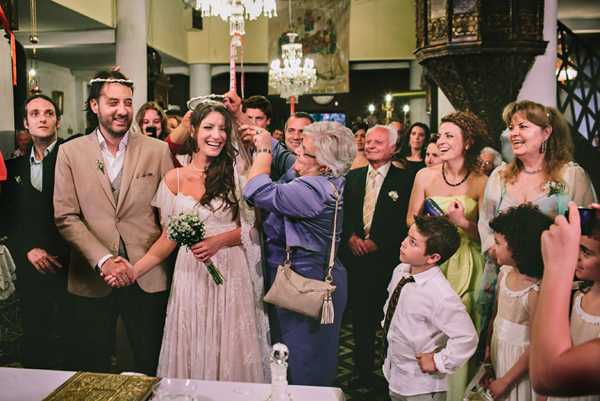 The bride looked beautiful in her Konstantinos Melis by Laskos wedding dress. 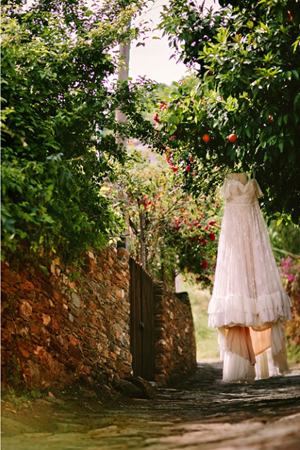 A whimsical empire styled wedding dress with French lace and toulle details. 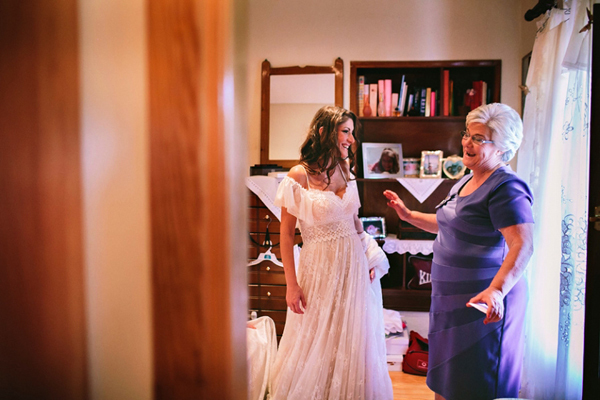 The ivory and flesh colored wedding gown was very romantic and it paired perfectly with the concept and feel of the day. 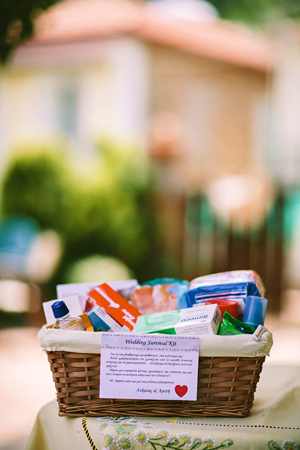 One unique DIY idea was the wedding survival kits for the guests. 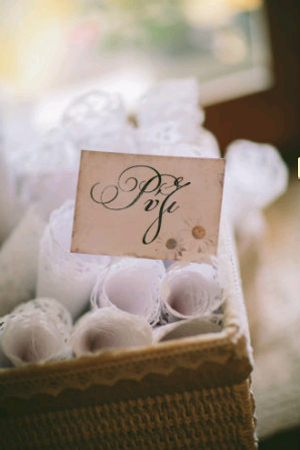 The hand-made wooden signs were one more DIY project for this special day. 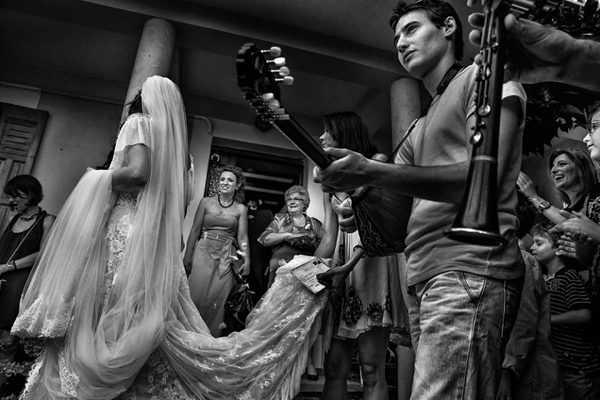 The bride was escorted to the church by her brother and her father. 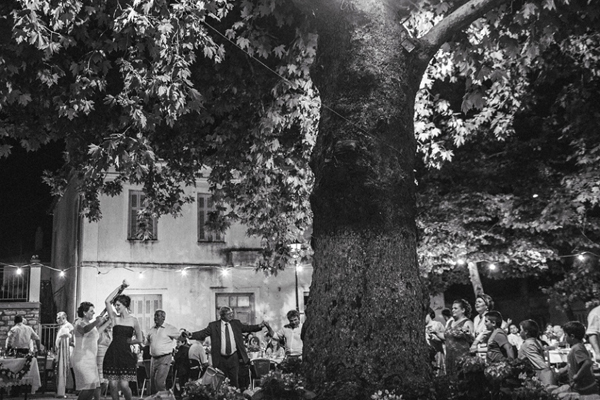 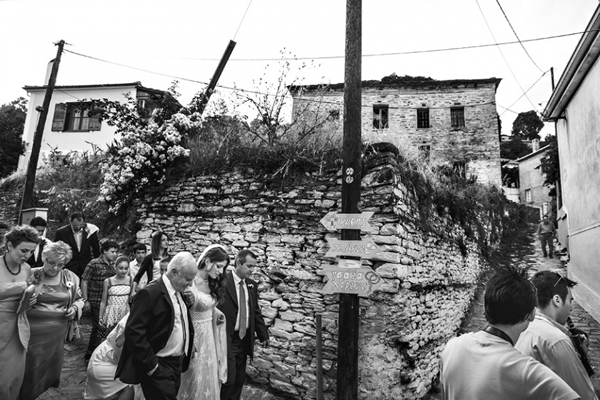 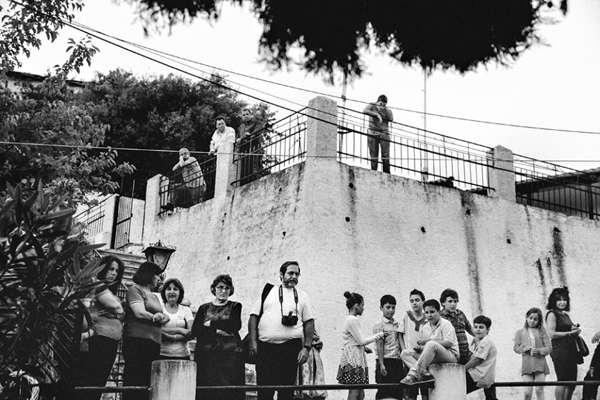 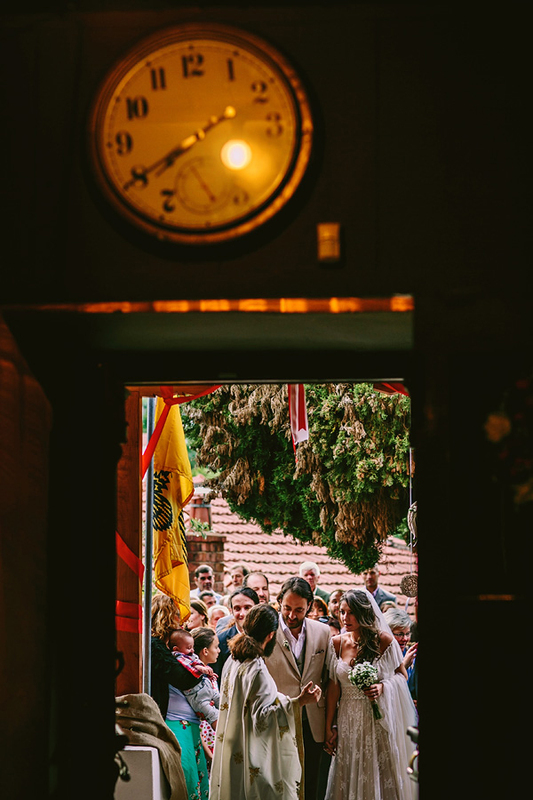 Just like every tradiotional wedding in Pelion, the bride is escorted to the church by the entire village with traditional music. 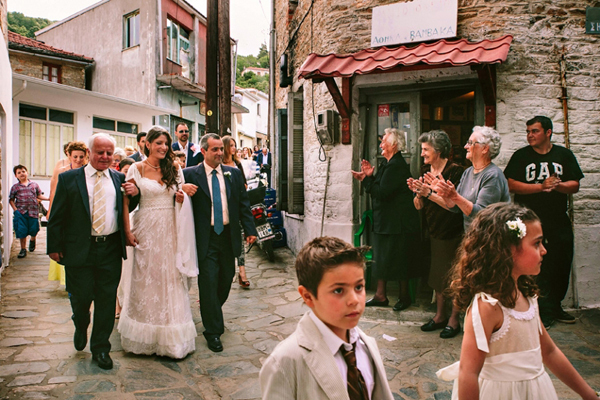 The ceremony took place in the Church of Koimiseos of Theotoko, known for its beautiful selection of Saint Paintings. 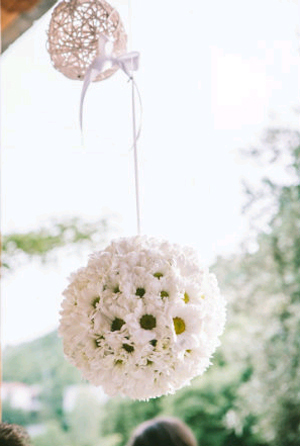 The bride’s bouquet was an exquisite selection of wild daisies and chamomile, held together with burlap and natural grass. 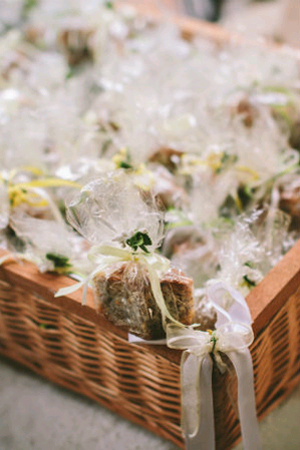 Many of the wedding details were DIY crafts designed by the bride herself. 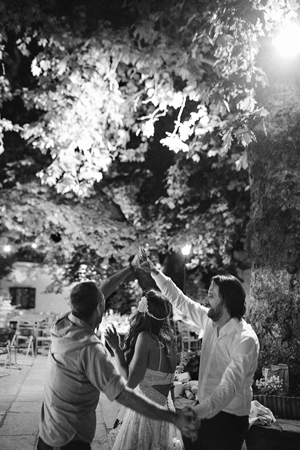 Such as the cones that were to be filled with rice for the guests to throw at the nuptials. 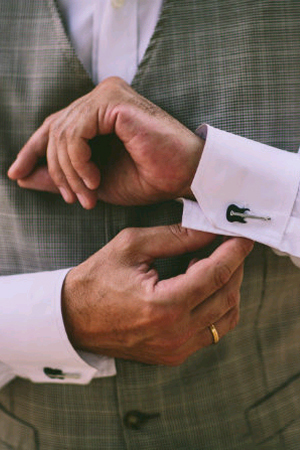 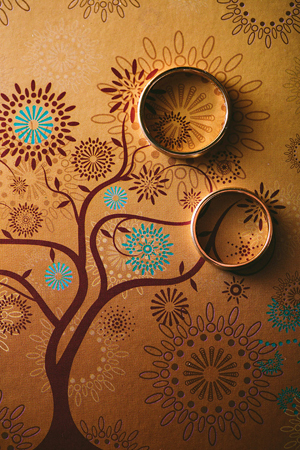 The hand-made crafts gave a special touch and intimacy to their special day. 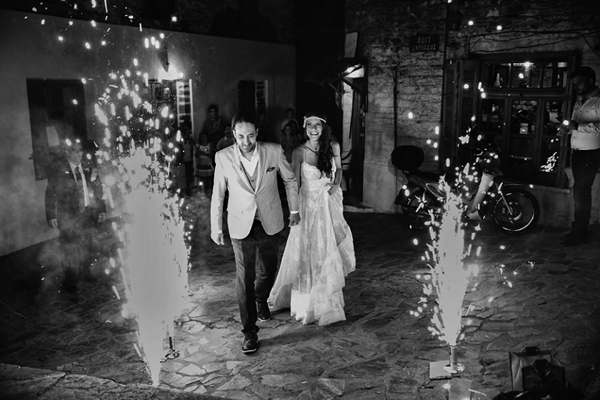 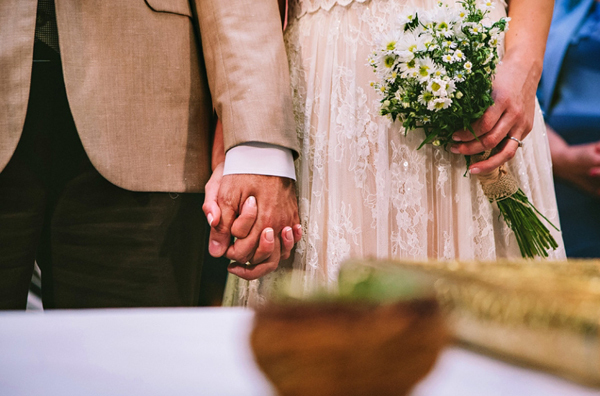 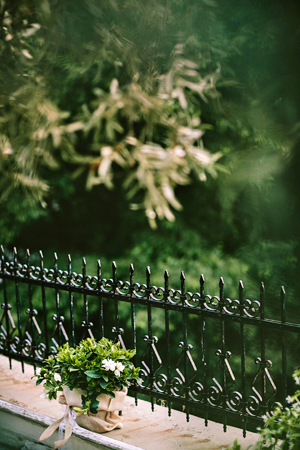 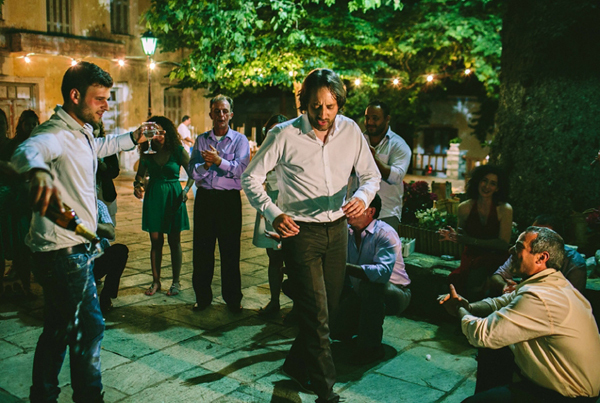 All the wedding details were curated carefully by the bride and had a romantic feel, just like having the wedding reception in the town square. 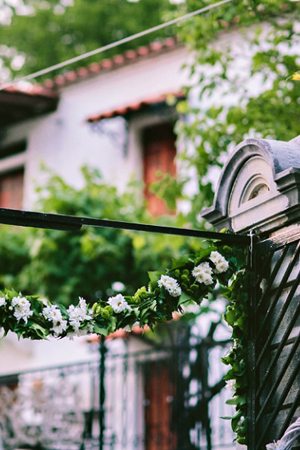 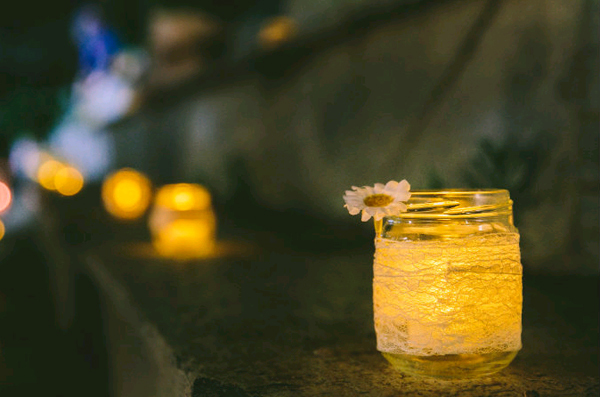 A fairytale wedding in Greece: countless jars, decorated with natural materials such as burlap, lace, twine and wild daisies, were placed on all the steps in the town square. 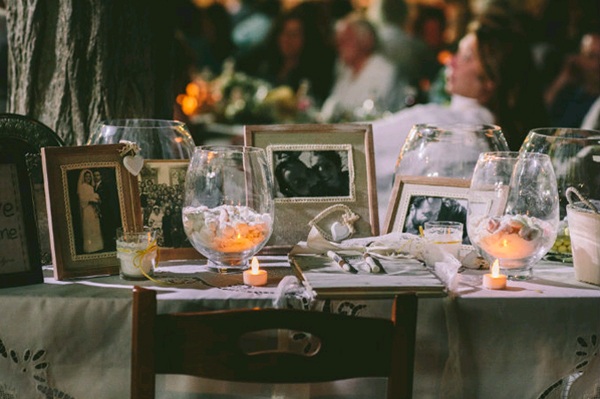 The Wishing Table was decorated with pictures of the couple, featuring various moments throughout their relationship. 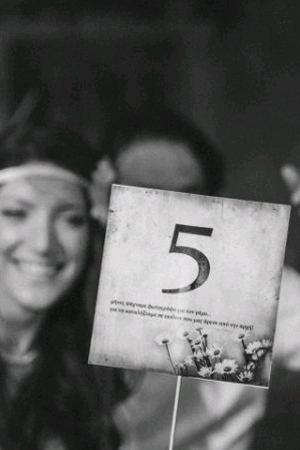 Friends and family had the time of their life in a very warm atmosphere..
A unique wedding idea was the table signs that the bride used to number the reception tables. 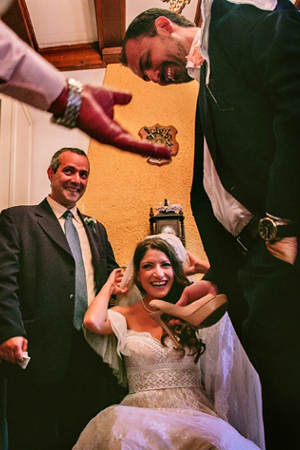 Each table sign had a fact of the couple’s relationship written on it. 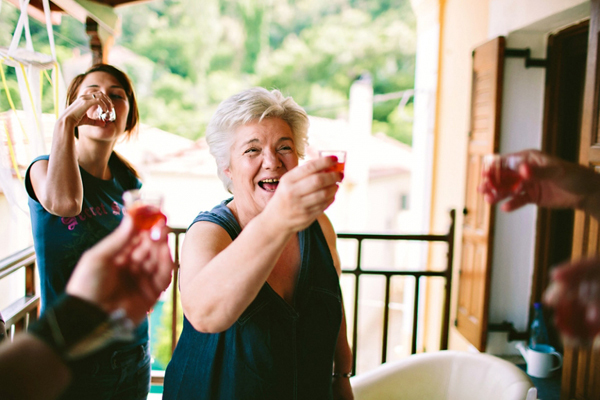 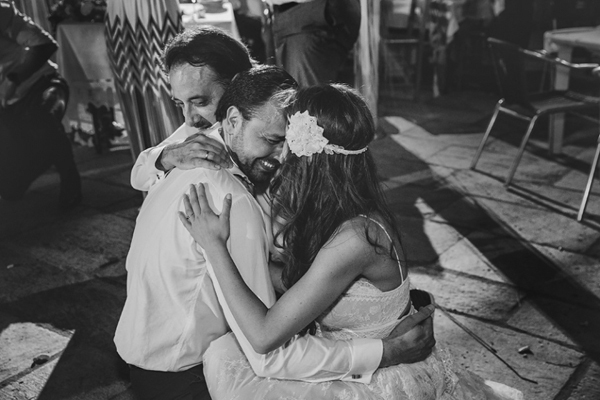 Beautiful moments captured by the very talented photographer GEORGE PAHOUNTIS.